This month's Most Coveted list is equal parts wishlist and love list. Enjoy! 1. 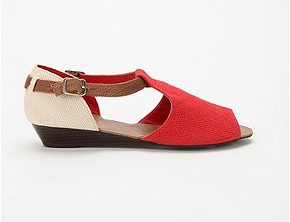 Contributor by Rachel Comey sandals ($49 online at Urban Outfitters). Flat and low-heeled sandals are much more interesting than flip-flops when it comes to summer footwear options, particularly when they have cool details like colour-blocking, strap loops and a low 1" wedge heel. If red is too bold for you, don't fret: the black version (featured in I'm the It Girl's latest Shoe Wednesday post) is just as stylish. 2. Alice + Olivia petal sleeve blouse ($221.08). Trends may come and go, but a black-and-white tie-neck blouse has perennial appeal. I like how the sleeves and tie have a soft fluttery quality in Alice + Olivia's version, probably thanks to the luxe silk crepe fabrication. 4. The trailer for Black Sheep. Has anyone seen this movie? It's a horror film about killer sheep. Set in New Zealand. And yes, I'm being completely serious. I laughed so hard when I first saw the trailer that I nearly cried. Then I forwarded it to my manager and coworker. 5. Goody spin pins. My thick unruly Asian hair decimates regular bobby pins. They either slide out or become splayed and useless after I stick them in a bun, and it always seems to take more bobby pins than I expected to achieve the perfect 'do. 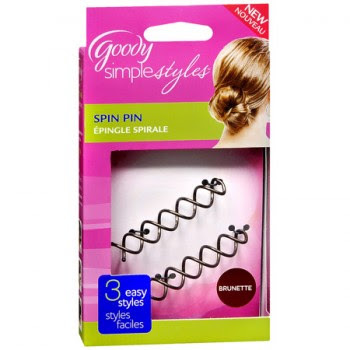 This summer though, I've been relying on the Goody spin pins to put my hair up quickly and easily. Just two corkscrew pins that never splay or bend out of shape, one or two bobby pins to tuck in stray ends, and I'm good to go. The spin pins create a bun that stays in place quite well if you're doing nothing more than sitting in front of a computer and going about your day, although it doesn't hold up to an intense workout or a slew of salsa spins. Oh well, you can't win them all! Spin pins are great. I am still on the hunt for the mini ones. Where can I get those pins? 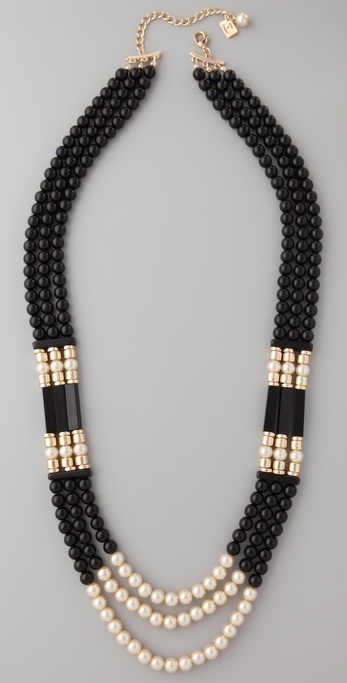 The necklace is lovely and very art deco with the two-tone colour blocking. I also love the Goody spiral pin thingies. They do a great chignon! Leesh, I bought a set of the mini ones at London Drugs a couple weeks ago! Still haven't tried using them to create mini buns though. Xing, you can find Goody spin pins at most drugstores like Shoppers Drug Mart or London Drugs. I love those shoes! I'm always looking for sandals with a low heel like that - they're as comfy as flats, but give me a little extra (and much needed) height. Spin pin! GENIUS. I definitely must invest in one. Great list. This is probably going to sound stupid, but how do those spin pins work? Maggie, first you gather your hair in a ponytail. Then you twist one pin up from the bottom of the bun and one pin in from the top of the bun. Twist in a clockwise direction and make sure the pins don't cross in the centre. If you're still confused, there's a ton of tutorial videos on Youtube. The sandals and the blouse are cute! i've been looking for small wedge sandals like that this whole summer. they are perfect! !